In a skillet, brown the sausage, drain well. Bake at 350 degrees for 20-25 minutes, or until a knife inserted near the center comes out clean. Total carbs: 3.3 grams for TWO muffins! Ok, anybody want to add their ideas, tips, recipes for make ahead food? Remember, it doesn't have to be a FREEZER food, just something that you can make ahead. With Super Bowl right around the corner, got any good dips, snacks, recipes??? I'd love for you to link up to this post and be able to visit for more ideas! If you link up one of your posts, please link up to my blog so others can check out any other link ups here. Just good manners (smile) thanks! This looks really yummy! How many does it make? Visiting from SITS. Happy Friday! This is a great idea. 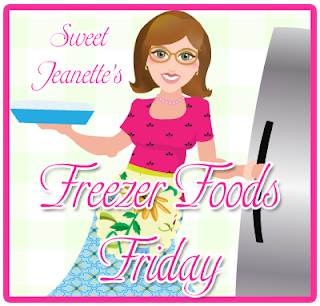 Do you do your freezer cooking once a week? I'm not a low-carber but I love high protein breakfasts. I make a similar recipe with turkey sausage and we love it, especially since it can be kept in the freezer and grabbed on a busy morning! Thanks for sharing!